What better time to throw our biggest "Meet The Makers" party yet than during the Venice Art Crawl? 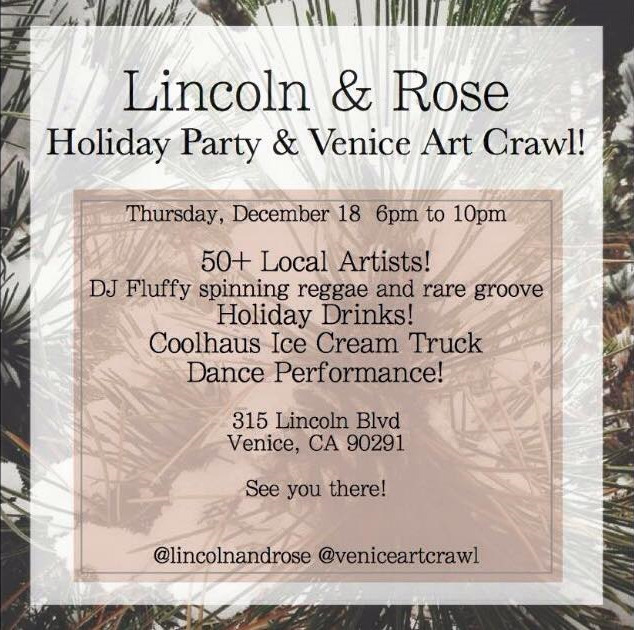 Join us for our last hurrah at the Lincoln & Rose Pop-Up Shop Thursday, December 18, from 6 to 10 pm. We're at the corner of Lincoln & Rose in the Rose center mini strip mall with Chinatown Express, Checks Cashed and the new Banh Mi Sandwich Shop! In addition to our incredible collection of goods amassed from more than 50 local artists, we'll have the Coolhaus Ice Cream Truck serving up their frosty works of art, Venice local DJ Fluffy, and pro dancers Jacob Jonas The Company getting everyone in the groove. If you've yet to visit us at the Pop-Up, now's the time! We're closing up shop at December 31. See you Thursday night.